Really Bored and Looking to RP my Ghostbusters Plot, If any one is interested, Hit me up! After the Event of Ghostbusters 3 (The Video Game, Based in 1991) Dana Barrett had been out of the Picture for some time. Peter had continued working for the Ghostbusters and all 4 had made it big! The Ghostbuster name and each individual name, respectfully, had become household words! Months after the Incident in the New York Harbor, Dana, out f the blue, called Peter to inform him that He had a son. Jonathan Peter Venkman. When Peter found out, He was flabbergasted. Dana had never told him about about Jonathan until after She had saw them on TV again. Jonathan Peter Venkman was born April 4th, 1986. Two Years after the event of Dana's Apartment building and the coming of Gozer and 3 years before the event in the Manhattan Museum of Art. Dana had managed to keep Jonathan from him after they had broke up, not weeks after she found out she was pregnant. AT 28 years Old, Jonathan has graduated from Columbia University in New York City, where his father had been thrown out so many years before. Graduating top of his class in Parapsychology and minored in Physics. Of course with this kid, you never knew he was this smart. He had no ambition, No Drive and no interest in working at all in his field of expertise. Johnny pretty much sat around all day and play video games. He worked small part time jobs just to get food and rent money. Living in NYC was not an easy task. Knowing who is Father was, Johnny never really showed any interest in Busting Ghosts like his father had done for years. Until recently. Dr. Egon Spengler had passed away from Vasculitis. The Team had been knocked down to 3 Members, all who were aging and well into their 60's. Egon had been 69 when he passed. Now, presently, Johnny is 32 Years old, Dr Venkman, Dr. Stanz and Mr. Zeddemore were 67, 65 and 72. All 3 had decided to retire. Ray had decided to live out his years in the Firehouse, being as he sold his childhood home to buy the Firehouse, and act as a Liaison and Mentor for Johnny. 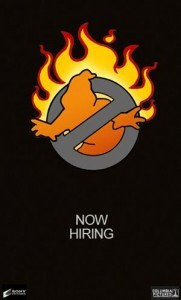 Now Johnny must find a group of willing participants to keep the Ghostbusters name alive and well.